It's been a year of upheaval for Edward Stanton, a forty-two-year-old with Asperger's syndrome. He's lost his job. His trusted therapist has retired. His best friends have moved away. And even his nightly ritual of watching Dragnet reruns has been disrupted. All of this change has left Edward, who lives his life on a rigid schedule, completely flummoxed. But when his friend Donna calls with news that her son Kyle is in trouble, Edward leaves his comfort zone in Billings, Montana, and drives to visit them in Boise, where he discovers Kyle has morphed from a sweet kid into a sullen adolescent. Inspired by dreams of the past, Edward goes against his routine and decides to drive to a small town in Colorado where he once spent a summer with his father - bringing Kyle along as his road trip companion. The two argue about football and music along the way, and amid their misadventures, they meet an eccentric motel owner who just might be the love of Edward's sheltered life - if only he can let her. 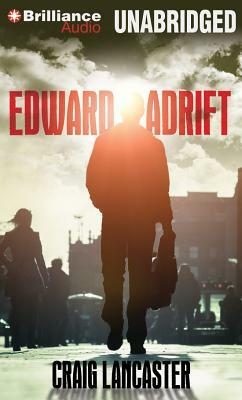 Endearing and laugh-out-loud funny, Edward Adrift is author Craig Lancaster's sequel to 600 Hours of Edward.